Well now. Up until a few weeks ago I'd never ever played a board wargame. Ever. They didn't have the visual appeal I wanted in my wargaming (too many weeny cardboard counters), and I'd heard the rules tended to be fiendishly complicated and long winded. But they do have the advantage of taking up a small amount of space, and there's no painting involved. 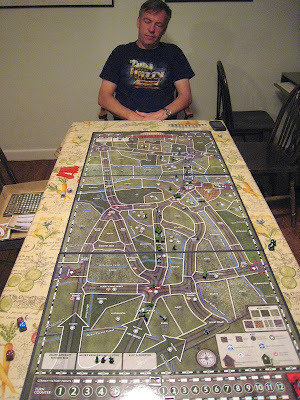 Now, my friend and wargames buddy Paul is a bit of a board and parlour game enthusiast - loves inviting people round for a spot of Monopoly or some such - and so when I happened upon the Flames of War 'A Bridge Too Far' boardgame a few months back, we agreed to go halves on it. What the heck. We ordered from Maelstrom Games, and paid £27 including p+p, which is about as cheap as you can get it (RRP £30). A reassuringly big box was delivered in the post a few days later. Of course, I'd done my online homework so knew more or less what to expect, and I was not disappointed (apart from the corny artwork). The game board is good quality and very nicely printed out. It comes in 3 sections and measures a total of 48" x 22" (120cm x 55cm). The playing pieces are vehicle models in around 1/285th scale, and infantry figures in about 1/100th scale. They are hard plastic and could easily be painted up if you wanted. Overall they are quite nice representations: they certainly satisfied my own need for 'real' miniatures rather than counters. There are some cardboard counters, which are nicely made from thick card, some themed dice (you can never have too many dice) and a few other bits and pieces. The rule set is full colour with loads of the type of illustrations you would expect from FoW. You can play the 'historical' game, where deployments are made according to those of 1944, or you can choose your own deployments and see how your ideas work out. Paul and I have played one of each type of game, and both were very enjoyable. I won't bore you with a detailed run down of the rules. We found them complex enough to make an interesting game with some mild intellectual stimulation, but simple enough not to be a drudge. The various moving, deployment and fighting phases interlock well. Chance has a significant role, but good tactics and thinking things through will give you a good prospect of success. We found no glitches or problems during play - this seems to be a well worked-out and well play-tested game. Games have a standard length of 5 turns. The box claims games take 60 - 90 minutes. Well, our first game took 3.5 hours, with the usual learning process and frequent reference to the rules (which are well laid out and well explained). The second game a few weeks later seemed much quicker and easier, but still took the best part of 3 hours. This was not a problem - the time flew by. But I reckon playing a game in under 2 hours is unlikely, unless you play on a really regular basis. After a tough three and a half hours in command, Paul needs a snooze. There is not much online support for the game, though you can find some comments and reviews at Board Game Geek. There is also the odd comment on the official FoW forum, but this seems to be The Boardgame That Battlefront Forgot, which is a shame as it makes for an entertaining change from getting the miniatures out. There is plenty of replay value - the more familiar the rules become, the more you begin to appreciate the various tactical options. I know we'll be getting this game out again in the future. In short, this is a good cross between 'real' wargaming and those boardgames you've been avoiding all these years. Well worth looking into. Looks interesting. Paul is obviously a man of taste .... Thin Lizzy are the greatest band ever... it's a fact. That's a huge map! It looks really well produced. I wonder, is this FOW's attempt to diversify into the boardgame market? If it is, they don't seem interested in following it up. The game came out in 2010. I think it's a very good effort, with plenty of potential for other operations/campaigns, but maybe it didn't sell well enough. And FoW have their 'Firestorm' campaign system - perhaps this was seen as competing with that. Avalon Hill in the 80`s produced a game called Storm over Arnhem.this game reminds me of SOA.I always thought that thin lizzy never got their props in the USA.Lynott knew how too write a decent song. Thanks for the write up Keith. I may keep a weather eye out for this as a future purchase. Or just pop over and play a game! For free! 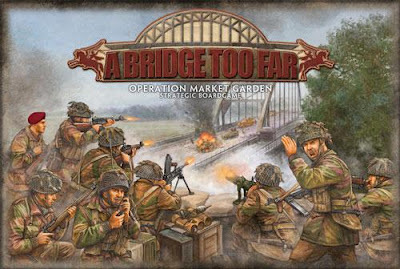 War boardgames like Bridge Too Far is as exciting as the virtual versions. Good move for getting that board game. Have fun!